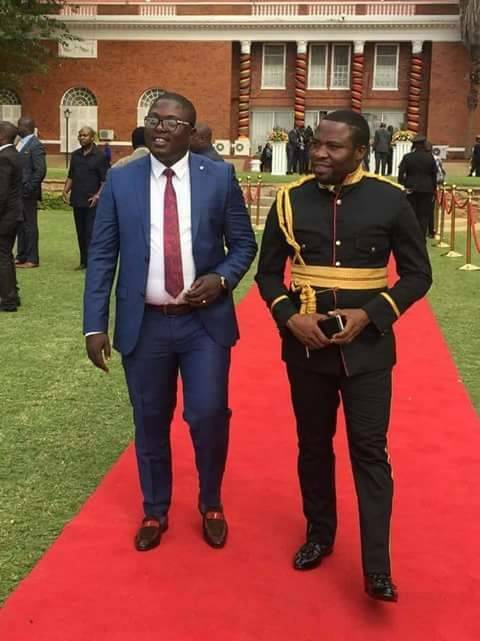 Only a week after a student from Lusaka Apex University broke into state house with a motive to steal state secrets, President Edgar Lungu has taken a step to appoint Zambian Gospel Artist as part of the security team at state house . Kings Malembe Malembe a gospel singer who vowed to sing praises and pledged his full support to President Lungu in the 2016 General election has been rewarded for his continuous support and loyalty to the PF. Malembe Malembe becomes the first Zambian artist to be bestowed with such an important position. Congratulations to Mr Malembe Malembe. Pic a few minutes after the swearing in ceremony at state house.